The world of Far Cry is ever-expanding, and it just got a little bit crazier. Ubisoft announced that assets from Far Cry 3: Blood Dragon are have joined the Far Cry Arcade map maker in Far Cry 5. 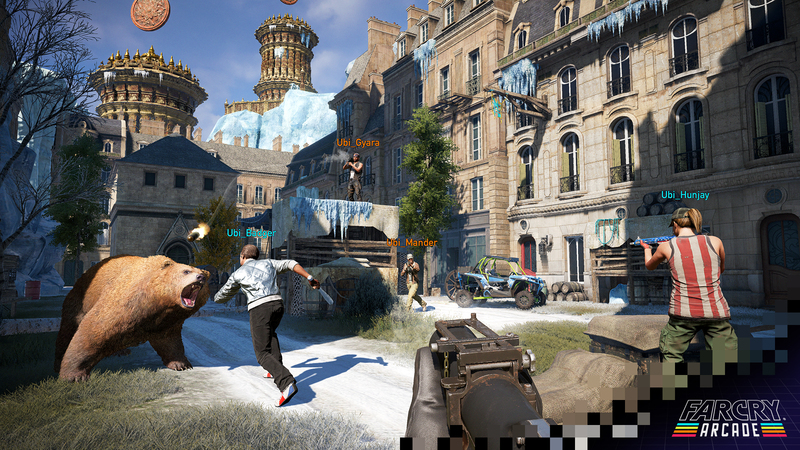 In addition, the team at Ubisoft added two new maps to Far Cry Arcade to celebrate. The updates for Far Cry Arcade are to celebrate Far Cry 5‘s six month anniversary. For those unaware, Far Cry 3: Blood Dragon was a stand-alone expansion to 2012’s Far Cry 3. It had a retro-futuristic aesthetic and parodied 80s action films. Far Cry Arcade allows players to create maps using assets not just from the Far Cry series, but other Ubisoft franchises, as well. The two new maps coming to Far Cry Arcade are Passage and Blood Dragon Arena, and they bring together elements from all across the Far Cry Universe. Passage crosses over the three post-launch expansions for Far Cry 5. You will encounter elements from Hours of Darkness, Lost on Mars, and Dead Living Zombies as you journey to face the Blood Dragon. Blood Dragon Arena, on the other hand, only uses assets from Far Cry 3: Blood Dragon, but that game is crazy enough to stand on its own. Far Cry 5 is available now on the PlayStation 4, Xbox One, and PC.